Twas almost a year ago at the start of my fellowship at TRU that I started what would become the TRU Writer SPLOT, a tool I think has some legs, and maybe arms. This is on the heels of some demos Brian did last week at the 2015 ETUG Fall Workshop and what we will present next week at the Open Education Conference as SPLOTs and Darkweb Plots: Advancing and Supporting Open Educational Experiences. 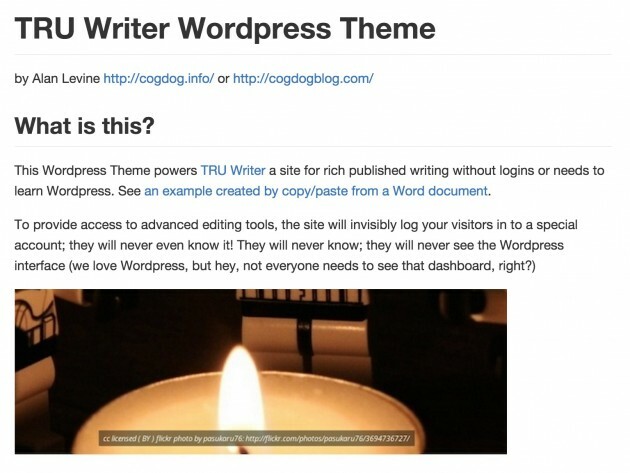 The TRU Writer is a tool for publishing to the web that uses WordPress as an engine, but never exposes the writer (lower case means the person, I loathe “user”) to the WordPress Dashbboard– they do not need accounts, and writers can choose to credit themselves by name, pseudonym, or just old fashioned Anonymous. That top image? I wrote and published that in about 5 minutes, most of the time finding the links. Check it out. Or better yet, just go play with it. This is a child theme that has all the function baked in and using the lovely Radcliffe theme for making it look pretty. What is sneaky is that the form where you write actually secretly logs you into WordPress (you cannot see the admin bar or the dashboard, go ahead and try). This actually had to be done to provide access to the media uploader for embedding images in what you write. In writing, you can format everything you can on the inside, embed media. But what was even a better discovery, that I did not know, is that you can literally copy content from MS Word or Google Docs and paste it into the writing form. This was always the pitfall that rendered your written bloated with MS HTML cruft, but the WordPress editor now strips out most of the crap. I tested this with the Word version of a paper I co-authored in 2008 with Bryan Alexander, you can see how it preserved the standard formatting, headings, lists, links, and even the internally linked footnotes. In the time since then, Brian has made clones of it for several faculty at Thompson Rivers University, most elegantly done as pretty much a course site for L21C (Lawyering in the 21st Century, TRU). I made a prototype for a TRU journal Small Cities Imprint – in this case a static WordPress front page is the table of contents of the current issue. … I finally got the code updated on github AND added real freaking documentation!! Now the docs are probably pretty thin, and a few typos are surely swimming around. But instructions were long overdue, though some folks seem to figure it out! First of all, the way I had the password for the secret account was a horrible and insecure hack. With some wrangling over hooks and order, I got things lined up where the password is enter in the theme options. The site can now be set up to require all submissions be moderated (the only option before) or they can be directly published to the site. It can also be set up with Creative Commons licenses; either the site Admin can say “ALL THINGS WILL BE PUBLISHED WITH CC-BY” or it can be set so the writer can select their favorite license flavor. The biggest thing is now there is a way for people to go back and edit after they have published! The whole thing about anonymous publishing is… well you are no longer connected to the thing once it is published. Now, of you provide an email address, you can request a special edit link, a URL that can only be sent to the author. 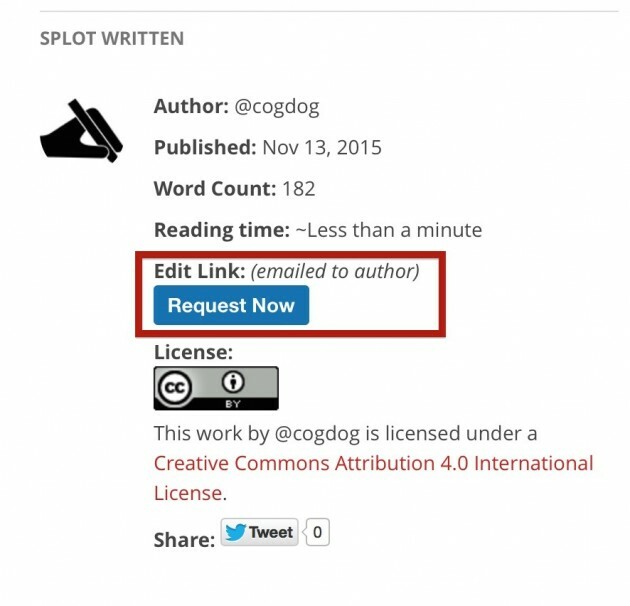 Clicking the “Request Now”button will send a special coded link to the author. Don;’t be mean and pummel someone with requests, ok? That feature is moderately tested (meaning I got it to work). I am putting this use for the UDG Agora Project where we are asking our participants to publish the results of their best project, in the hopes we will create a collection of some 300 student-centered teaching practices that were done using mobile technology. This version, which we call Comparte (“Share) has a few special modifications to provide some extra reporting fields, an extra taxonomy, and we will be translating the writing form to Spanish. It will be exciting (and a bit scary) to see people try and run with it. I’m not guaranteeing a lack of bugs! And I have some plans to write up the image sharing Collector SPLOT too. So explore the first TRU Writer SPLOT at http://splot.ca/writer and check out the code at https://github.com/cogdog/truwriter. Or come to our session at Open Ed next week. Just great Alan, I recall kicking tyres of the first version with delight. Just added another to the new system without problem (awaiting moderation I presume). Exactly the kind of thing that is exciting about open ended software like WordPress.